Often, the Guardian allows its Israel page to peddle Electronic Intifada style propaganda – fact-free hyperbole and hate that has no place at a serious ‘respectable’ news site. Today is one of those days, as editors decided to publish a diatribe against Israel by the director of a radical anti-Israel NGO (Israel’s BDS blacklist is straight out of apartheid. The UK can’t condone it, Jan. 10). The big lie in the op-ed, by War on Want (WoW) director Asad Rehman, in response to Israel’s decision to ban leaders from 20 pro-BDS groups from entering the country, that Israel is an apartheid state, shouldn’t drown out the ‘smaller’ lies, which begin in the opening paragraph, when readers are told that Israel’s “blacklist…bans 20 charities and human rights groups from entering the country…”. However the groups banned, such as WoW, are not “human rights” organisations in any real sense of the term, but rather highly politicized radical anti-Israel pressure groups. Indeed, in 2016, the British government stopped funding WoW, a sponsor of ‘Israel Apartheid Week’ in the UK. The decision was reached following revelations that a speaker at a WoW event legitimised the lie that Israelis were harvesting dead Palestinians’ organs. At another WoW event, radical professor Steven Salaita justified Palestinians terror attacks against Israelis. Other groups subject to the Israeli ban, such as Jewish Voice for Peace, have hosted and praised Palestinian terrorists, and have promoted antisemitic messages. One JVP video included the outrageous suggestion that Jewish organizations are responsible for the killings of blacks in the U.S. by police. In his op-ed, Rehman compares Israel’s ban on pro-BDS groups to restrictions imposed by South Africa during Apartheid. However, whatever the merits of the Israeli law, as our colleague Gilead Ini recently demonstrated, it is in fact not substantially different than restrictions imposed by democracies such as the US. As Ini noted, that’s much broader than Israel’s language. All democracies have regulations governing the issuance of visas and border entry regulations — there are inherent in state sovereignty. Countries [such as the UK] routinely ban racists; individuals who incite to violence and create social disorder/polarization etc. Tourist visas are not natural rights. This year we remember that it is 70 years since more than 800,000 Palestinians were forcibly displaced from their homes; they are still denied their right to return by Israel. However, no serious historian claims that all of the 800,000 [sic] Palestinian refugees from the 1948 War were “forcibly” expelled. Most fled – in, let’s remember, what was an Arab war of annihilation – out of fear, or because of instructions from Palestinian Arab leaders. Historian Benny Morris has concluded that there was no Israeli policy of “ethnic cleansing”. “At no stage of the 1948 war”, he wrote, “was there a decision by the leadership of the Yishuv or the state to “expel the Arabs”. Further, Rehman’s claim that Palestinians “are still denied their right to return to Israel” is extraordinarily misleading. First, there are only tens of thousands of Palestinian refugees, from the 1948 war, still alive. And, there is no legally recognized “right of return” for the millions of Palestinian descendants of refugees (children, grandchildren, etc) who, though still qualifying for “refugee” benefits from UNRWA, are NOT actually refugees themselves. Of course, if Rehman is indeed suggesting an unlimited right of “return” for 5 million non-refugee Palestinians to a country where most never once stepped foot, he’s essentially calling for the elimination of the Jewish state. 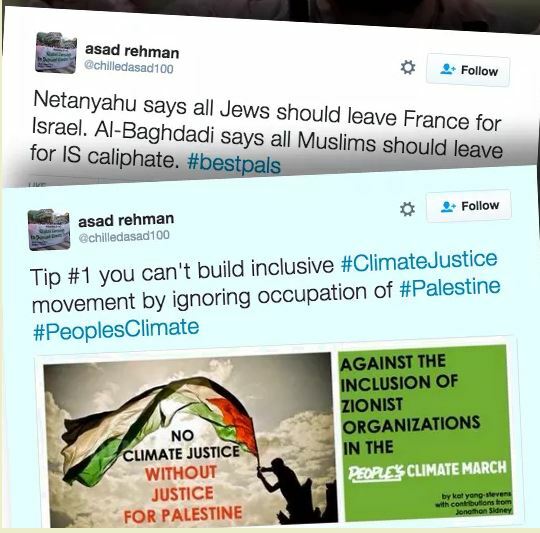 Rehman also falsely characterizes BDS as merely “a non-violent means of winning peace and justice”, when, as prominent BDS leaders have made clear, “peace” and “justice” are not their objectives. The BDS movement’s co-founder, and lead spokesman, Omar Barghouti has not only justified the Palestinian “right” to “armed resistance”, but made clear that he would never accept the continued existence of a Jewish state within any borders. Tellingly, Rehman himself has been revealed as someone who doesn’t merely advocate for Palestinian rights, but demonises Zionism and suggests its supporters are necessarily beyond the moral pale. Contrary to the narrative promoted by the Guardian, BDS is not a ‘progressive’ civil rights movement, but represents quite the opposite: a regressive campaign by radical activists, all of whom seem to share an unhealthy fixation on Jews ‘behaving badly’, and some of whom openly seek to turn back the clock on civil rights by denying Jews, and only Jews, the right to freedom and self-determination. Groups like War on Want, Jewish Voice for Peace, and New Israel Fund exploit the insidious tactic of giving themselves benign names. It actually works as there are very many gullible people out there. You are correct, and that’s why they do it. Dishonesty is in. That’s what necessitates websites like this one. Oh, I’m from Florida. I never that Florida had a totalitarian government until. Sigh, it’s individuals like you that make holders of geography degrees like me very sad. The Charlie in NY (if he’s the same one) comments BLT frequently at EoZ. He’s not an Israel basher. Oh, I see it from that angle now. My apologies, but as it was a reply to me, I took it that way. Omar was born in Qatar, grew up in Egypt, attended Columbia University in the United states and moved to Ramallah as an adult. While telling Palestinians to boycott everything Israeli and Israeli Academia in particular, Omar applied not to a Palestinian University to take graduate studies but to Tel Aviv University where he was accepted as just another student. Omar is a hypocrite because he talks about BDS being non-violent when he supports Palestinian resistance, all forms of Palestinian resistance. This means he accepts violence as a Palestinian right to achieve his goal of the destruction of a Jewish state and replacement by another Arab dominated state. This means he supports resistance in all forms such as suicide bombings, cutting the throats of Israeli children in their beds or blowing them up on their way to school or home. In reality his position is no different than that of Hamas’ charter except that he seeks a secular state instead of a theocratic state. Barghouti is living proof that an idiot can go to college and still come out an idiot. And exposing unsuspecting college students to the rantings of this unknowledgeable, and malicious screwball is educational malpractice (unless you’re trying to educate students about the existence of unknowledgeable, malicious screwballs). JVP paid for an ad in Newspaper to have terrorist Marwan Barghouti freed from prison. JVP = Sickos. In my opinion, The Guardian is in part a voice of the Marxist point of view. It appeals to those on the Left who would prefer a Socialist-Marxist state where the government controls all. Currently, Islam is making great inroads into Western culture. I believe they would love to replace it with Sharia law. England, France, and Germany are in this axis and the Guardian seems to lend credence to their EU leftist philosophies. When will the free peoples of Europe rise up against these interlopers? Thank God, we here in America have Trump to stand with us against the swamp. Yes Allan, and if you stand against a swamp you’re likely to end up with very wet feet. I fear in your case, based on the contents of your post, very wet feet will probably cause brain damage. In your case that’s already happened. leah27z I am still waiting for your answers to the questions I put to you yesterday. It is rude to keep people waiting and I’m sure you would not want people to come to the conclusion that you are rude, bad mannered, and ignorant. So do get your finger out there’s a good old dear.